Empire of the Moghul; the Tainted Throne is the book of historical adventure series and this series is set in the Moghul Empire and this book is in the fourth position. Now, you can read its Bangla translation. 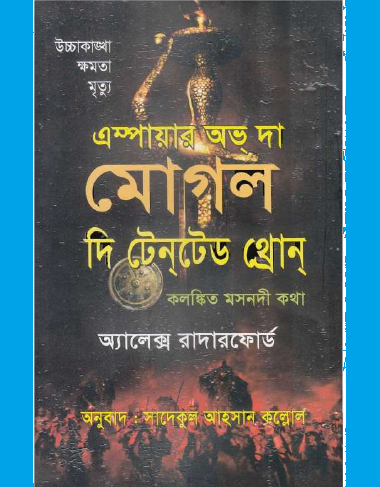 The book is available on Bangla language which means here you are getting a Bangla translated ebook. Jahangir is a father who has to fight against his son. For this reason, he is so hot on the trial of his rebel. Khusrau is a son of Jahangir and he has declared himself as emperor. But, what has khusrau declared are not match for his father’s. After fighting father and son the battle was quickly over and the son Khusrau was captured. Khusraus’s soldiers impaled on the wooden stakes and this was the emperor Jahangir order. And this punishment was given only of his soldiers but Khusrau’s life was spared and he was thrown in the dungeon. This book was deal with the relationship between emperor and the crown prince and the crown prince was Khurram(the future Shah Jahan). When Akbar was almost caught by Jahangir in the last book then you will see this character was far more balanced. Mehrunissa, all better known as Nur Jahan was fascinating. And you will get in this book, how she and Jahangir came to be married. If you want to read the Bangla translation of Empire of the Moghul; the Tainted Throne by Alex Rutherford, You are required to click here!